The shoulders are one of the most common areas of the body to hold stress. Many of us who sit at desks all day or spend lots of hours behind the wheel commuting know that the shoulders become tense and need attention. Yoga poses that focus on the shoulders are an amazing way to release this tension and reset your body. Here are the 7 best shoulder-opening yoga poses you can practice to release tension. This pose is a wonderful passive relief for many areas of the body but especially the shoulders. By folding over your bent legs and reaching your arms to the end of your mat, you are letting the shoulders fall open and relax. Be sure that your shoulders aren't creeping up towards your ears, but rather encourage them to move down your back. Hold this pose for a minute or two to allow the stretch to move deep into your muscles. After the initial opening allowed by Child's Pose, I like to grab a block and take things to the next level. Place the block at the top of your mat, walk your hands forward on the mat so your hips rise off your heels. Place your elbows on the block, point your hands up towards the ceiling in prayer position. Now, start to lower your head between your forearms and sink your hips back slightly. You'll feel an intense stretch in your shoulders, so only go as far as feels safe for your body. From your hands and knees, with knees hips distance apart, place the crown of your head on the mat. Reach your hands behind you to grab ahold of the tops of your feet. Simultaneously pull on your feet while pressing your shoulder blades forward. This will create a wonderful opening in the shoulder blades. Come back to your hands and knees. Reach your right arm open to the ceiling, then thread it under the left arm, bringing your right shoulder and cheek to the mat. The hips should stay lifted. If you want to work the left shoulder at the same time, reach the left hand behind you towards your right hip. 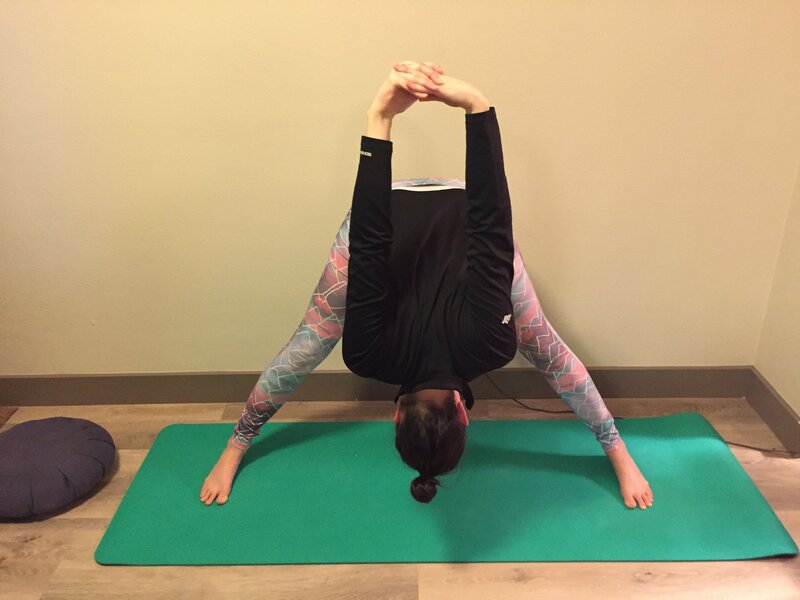 Do this pose on both sides. This pose can be done either standing in Eagle pose or seated on the mat. Simply hook the right elbow under the left, and wrap the hands so that your palms meet. Work on getting the shoulders to stay away from the ears while also raising your elbows to deepen the stretch. Again, either stay in Easy pose with crossed legs, or stack the knees for Cow Face pose. Reach your right arm behind you and place the palm between the shoulder blades. Reach the left arm back and try to take hold of the right fingers. If the hands don't quite touch, grab hold of the fabric of your shirt, or use a strap. Practice on both sides. Take either a wide-legged stance, or feet together with bent knees. Interlace your fingers behind your back. Hinge your upper body forward while bringing your hand up over your head and away from your body. Be gentle with yourself as this pose can be intense. As with all yoga poses, listen to your body and be wary of any existing injuries or sensitivities when moving through these poses. The shoulders are a delicate body part and it is important not to push them too far. I wouldn't recommend doing all of these poses in succession, but rather choosing two or three to do in the morning or at night to ward off the accumulation of stress in the shoulders. Enjoy!